As it’s not possible for more than four people to be listed on a UK Land Registry deed, each property listed on the Property Partner platform is purchased by a special purpose vehicle, a UK Limited Company, that you can then in turn buy shares in. There is a different UK Limited Company for each and every property; therefore you will always be investing in a specific property of your choice. Below we explain the options for exiting your investment and potentially realising capital growth. You can do this at any time and at a price of your choice. Your investment appears as a “Resale” opportunity on the platform and is available for other investors to acquire. We always provide you and prospective purchasers of your investment with an estimated valuation (on a per share basis) that is updated monthly. However it is your decision what price to buy or sell at. Depending on the price you’re offering your investment for sale at, the opportunity may or may not appear attractive to prospective buyers (and therefore may or may not sell). You can of course adjust the price to make it more attractive. 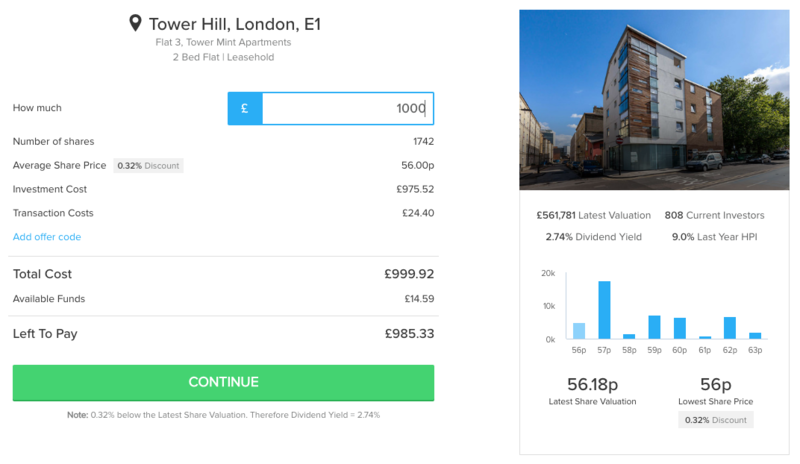 The image below is an example of our detailed property view that demonstrates the availability of shares at various prices. If an investor buys an investment in a resale property they are automatically provided with the cheapest shares first. There is no guarantee that anyone will be willing to buy your investment from you, whatever the price. In such a scenario your opportunity to exit is limited to (2) below. (i) The property is inspected and valued by an independent Chartered Surveyor with reference to factors such as recent transactions and the condition of the property, adjusted for any potential liabilities that the SPV may have, such as taxation. This is then divided by the number of shares the SPV has issued (1,000,000 in each case) to create a per share market value. (ii) Investors that would like to exit at this point will be aggregated into a block which will be re-listed on the Property Partner platform at the per share market value for up to 4 weeks. This process is similar to the initial crowdfunding process, save for less of the property is available. If this process is unsuccessful for whatever reason, Property Partner will commence proceedings to sell the underlying property. The property will be advertised for sale on the open market at the valuation determined by the Chartered Surveyor. Property Partner will administer this process and is obliged to act in the interests of investors to maximise financial return. On successful completion of the sale, all investors in that property will be exited and net proceeds will be distributed to investors. Note that third party costs, such as legal fees, will reduce the proceeds available for distribution but Property Partner will not charge any fees or make any profit on the sale whatsoever. It should be noted that if the underlying property is sold, this process will take as long as required and typically a full sales process is between 3-4 months. However, there is no guarantee of this and the sale could take longer. In conclusion therefore, you can realise capital returns by offering your investment for sale via our platform whenever you like. However there’s no guarantee that anyone will be willing to buy your investment at a price that you deem reasonable (or at all), so you must be willing to hold your investment for up to five years. Property Partner does not provide advice and nothing in this article should be construed as investment or tax advice. The information which appears in this article is for general information purposes only and does not constitute specific advice. Neither does it constitute a solicitation, offer or recommendation to invest in, or dispose of, any investment that is mentioned in this article. If you are in any doubt as to the suitability of an investment, you should seek independent financial advice. The value of investments can go down as well as up. Past performance is not necessarily a guide to future performance. There are risks associated with an investment in any of the products featured on our website.